This light and refreshing lunch incorporates some of the gorgeous Coriander-Carrot Vinaigrette from Gluten Free Girl and the Chef I made last week to accompany Quinoa with Southern Greens & Eggs, blending those sweet and bright flavors with the crisp bite of fennel and apple and the soft pliancy of toasted chickpeas. A satisfying lunch that won’t leave you feeling bogged down and bloated. Gluten-free. Easily modified to become vegetarian or vegan by omitting the tuna. The recipe for Coriander-Carrot Vinaigrette can be found here. Drain and rinse your chickpeas. Add to a dry pan over medium heat and toast until beginning to brown. Add to a large bowl when done. 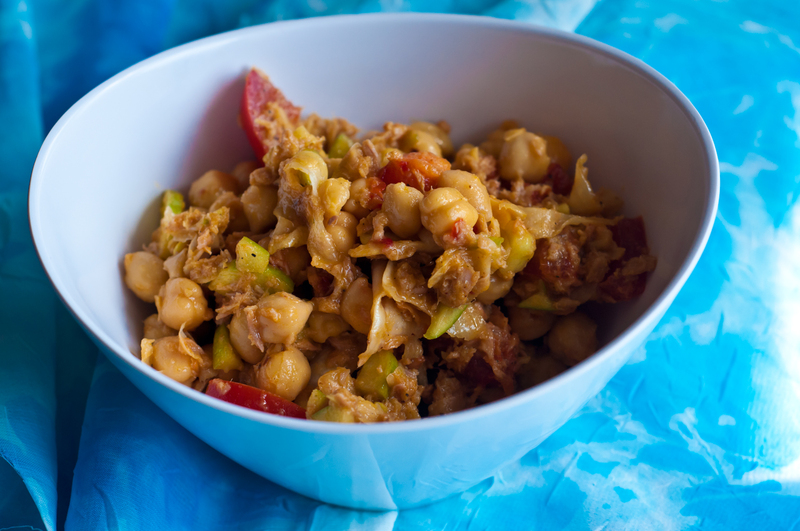 While the chickpeas are working, chop the tomato, shave the fennel, and dice the apple. Add to the bowl when done. Add the rest of the ingredients and toss to coat. Taste for seasoning and add lime juice and/or citrus salt as needed.